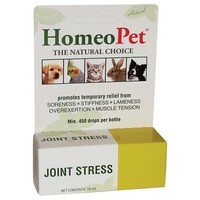 HomeoPet Joint Stress is a natural homeopathic remedy that supports healthy joint functions and mobility in pets. Made from 100% natural ingredients, the supplement will promote temporary relief from joint stiffness, which can occur in pets of any age, but is more common as an adult gets older. It will also support recovery from overexertion and muscle tension.